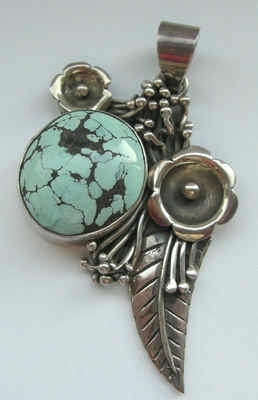 This is a one off gorgeouse pendant, it has a lovely light blue 20mm dia turquoise stone with natural markings which is so unique to the turquoise stone. The silver which has been worked around one side andthe top of the pendant is beautifully crafted into a flowers and leaves design. A nice large bail is added so that a good thick chain can be added. This pendant is a nice substantial piece, a good piece for the jewellery box which can be used over and over again.